Burnley moved eight points clear of the Premier League relegation zone with a come-from-behind 3-1 win over Bournemouth at Vitality Stadium. 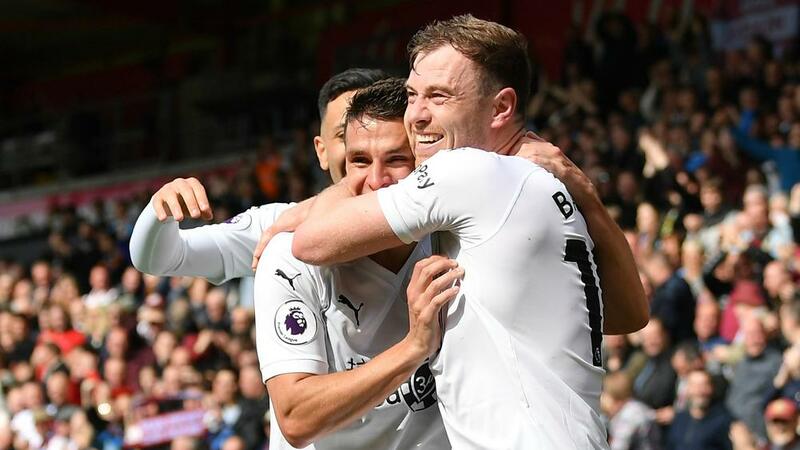 Ashley Barnes atoned for an early own goal by adding to quickfire first-half strikes from Chris Wood and Ashley Westwood as Sean Dyche's men sealed a second straight victory that lifts them comfortably away from next weekend's opponent Cardiff City. Bournemouth was clearly second best after letting their lead slip amid a frenetic opening 20 minutes and, outside of a wayward Callum Wilson header, offered little response on the way to a sixth loss in nine matches. Asmir Begovic, recalled for last weekend's loss to Leicester City, was at fault for two Burnley goals and his team has now failed to win any of its past four home fixtures. Goals always appeared likely with two porous defences coming together and Barnes gifted Bournemouth a head start, inadvertently nodding a free-kick beyond Tom Heaton in the fourth minute. Begovic's failure to address a Westwood corner allowed Wood to spare his strike partner's blushes and Burnley was ahead 139 seconds later. Chris Mepham only cleared Dwight McNeil's delivery as far as midfielder Westwood, who made no mistake with a side-footed finish. England international Wilson wasted a rare chance to equalise, ballooning a header from David Brooks's right-sided cross. Penalty appeals for a close-range Nathan Ake handball after the interval were waved away before Burnley's pressure paid dividends in the shape of a second Begovic error in the 56th minute. The goalkeeper fumbled a deflected cross under pressure from Wood at the near post, leaving Barnes to coolly atone for his earlier own goal by netting for the 10th time this term and sealing three points for the impressive visitors.